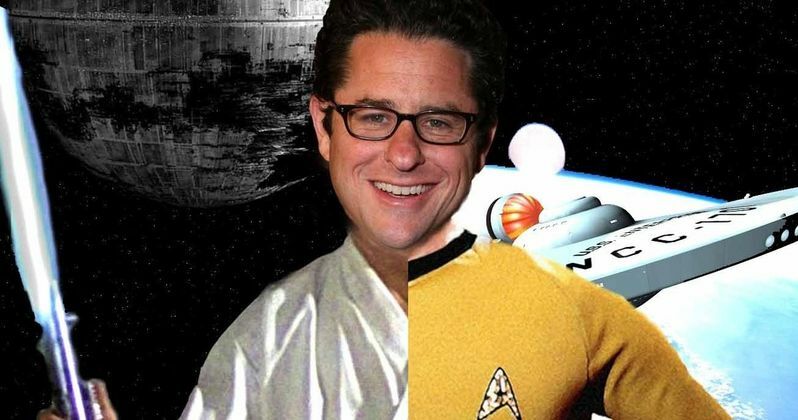 Star Wars or Star Trek: Where Do J.J. Abrams' Loyalties Lie? J.J. Abrams is at the forefront of the two biggest sci-fi franchises of all time. But which one does he love best? The director, producer and writer behind some of the biggest movies of all time was recently interviewed for THR's Awards Chatter Podcast. And he was asked where his loyalties lie when it comes to either Star Wars or Star Trek. And it's probably not tough to guess his answer. It's no secret that J.J. Abrams has never really been a Trekkie. But that didn't stop him from directing the first two movies as Paramount set out to reboot the Star Trek franchise. And even though he's handed off the directorial reigns to someone else for Star Trek Beyond, he's still attached as a producer. Instead of taking the helm on the third chapter in his Star Trek saga, he decided to direct Star Wars: The Force Awakens instead. That was a one-off deal. But he's also returning to produce Star Wars: Episode VIII. So, which property will probably get the most love and attention? J.J. Abrams won't come right out and say it. But he does, once again, admit that he's never really cared that much for Star Trek. Yet exclaims an undying love for all things Star Wars. "I was never a Star Trek fan. The only reason why I was intrigued was, I thought, this was a way to find a way to love it the way my friends loved it." Is this why Star Trek Into Darkness didn't sit very well with some fans? There seems to be a disconnect between J.J. Abrams and the material. And if the new Star Trek Beyond trailer is any indication, that hasn't really changed between films. A lot of longtime fans have complained that the trailer completely misses the point of what Star Trek is and what it's supposed to be. While Justin Lin is directing the movie, J.J. Abrams still has a heavy hand in what the finished product will be. While he's busy working as a producer on Star Trek Beyond for release this summer, he's also deep in pre-production on Star Wars: Episode VIII, which begins shooting this month. And he clearly likes this franchise over Star Trek. In fact, he loves Star Wars so much, he was afraid to get involved. "I loved that franchise so much that I actually was scared to take it on. There was a compelling opportunity to tell a kind of story on a certain kind of stage that I would never have a chance to do again." In the interview, J.J. Abrams admits that he was never a fan of sequels growing up. But when it comes to directing feature films, sequels seem to be his bread and butter. Of the five movies he's taken on as a director, only Super 8 was an original project, and even that was an homage to the work of Steven Spielberg. About directing so many sequels, he says this. "I remember when I was a kid I always sort of looked down on sequels. I remember saying, 'The sequel never equals.' I was a snob. I didn't want to be the person that you go to when you want to do a sequel." When J.J. Abrams so blatantly states that he was never a fan of Star Trek, does it make you worried for Star Trek Beyond? Or do you think 2009's Star Trek and 2013's Star Trek Into Darkness already proved that he does/or doesn't know what he's doing when it comes to Kirk, Spock and the rest of the U.S.S. Enterprise? Would you rather see someone else come in and serve as a producer?